Donald McNicol Sutherland was given The Governor-General`s Performing Arts Award in November 2000. He was awarded a Golden Globe in 2003 for his role in Path to War. He played the costarring role of Michel Dorn on the 2013 series Crossing Lines. In late April 2016 it was announced that Donald Sutherland would sit on the prestigious jury at the Cannes Film Festival, which selects the highly coveted Palme d’Or. One of the films in contention is Xavier Dolan’s It’s Only the End of the World. Learn more about Donald Sutherland. 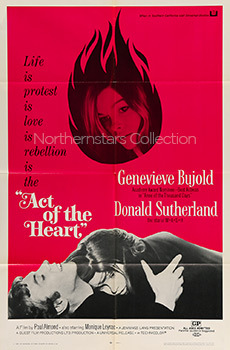 This poster for Act of the Heart was scanned from an original in the Northernstars Collection.